Sel de Vetiver, the latest scent from The Different Company, is said to have been inspired by Céline Ellena's “memory of vetiver roots macerating in a glass of water”. It is described as a "wet/dry mix of olfactive elements, recalling the harmony of earth and rain” and features notes of cardamom, geranium, grapefruit, ylang ylang, vetiver, patchouli, and iris. (Cosmeticnews.com) I must admit that when I sampled it for the first time, I was rather underwhelmed. The fragrance seemed indistinct, hazy, as if the water in the glass holding those vetiver roots was stale and murky. It took a couple of trials for me to start appreciating Sel de Vetiver. What was indistinct I now recognized as subtle and masterfully understated. The “murky” accord turned out to be a wonderfully raw, earthy, rooty blend of vetiver, patchouli and iris. The fragrance does have a certain watery, subtly salty feel, but it is by no means aquatic. The cardamom is there but it is a shadow of its sweetly-piquant self. The usually brisk, spicy geranium note is unusually subdued. Every note seemed hushed or indeed watered down; Sel de Vetiver speaks in a quiet voice, but somehow that voice is resonant and interesting enough to make one want to lean closer and to keep listening. In the middle stage, the cardamom and geranium give place to patchouli and iris as the companions to vetiver. I love that combination; the dry, earthy patchouli is complimented and balanced by the greener vetiver note, as for iris, its rooty-velvety quality both enhances the raw character of the accord and softens it. Rather unexpectedly, the drydown of Sel de Vetiver has plenty of grapefruit on my skin, thus making it the freshest and the "crispiest" stage of the composition. It has an appealing, mouthwatering sourness; it is a little peppery and all and all quite enjoyable. I would not call Sel de Vetiver my favorite vetiver scent, but its subtlety, its soft earthiness; its tasteful “wetness” definitely put it on my Top 10 Vetivers list. 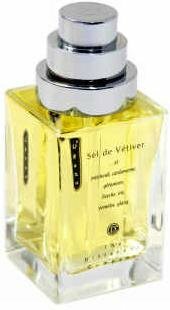 Sel de Vetiver is available on The Different Company website, €95.00 for 90ml, and they do ship to the States. According to Bois de Jasmin, Sel de Vetiver will be available in the US later this month. The image is from thedifferentcompany.com. Tomorrow, Vetiver 46 by Le Labo. I did a reapply of this today, and I've really gotten quite fond of it. It's ranking up there with Bois D'iris for me, which is a pretty lofty thing. Here is the thing...I wore Bois d'Iris and Sel de Vetiver side by side once...about 3/4th into its development, Sel smells basically identical to Bois d'Iris to me (just with a little less iris). Then that grapefruit pops up in the drydown and the similarity is gone. But still...they are definitely related. I'm having such fun puzzling over these descriptions. I cannot decide if I'd love it or hate it. You won't know till you try it. I can't really predict with this one..can go either way :-) I am 68% certain you will at least like it. ok,if you can predict percentage wise how much marchlion will like this,can you give me a prediction too? !Sounds sorta good,sorta scary. Hmmm. . . sounds verrrrry interesting. I like Bois d'Iris a lot, but am not ususally overfond of grapefruit, so I think I should probably stick with BdI. Looking forward to trying Sel de Vetiver, and for me it is a plus if it has anything at all in common with Bois d'Iris. I think you will like it. I am not sure though and I am very much looking forward to reading your thoughts on Sel.